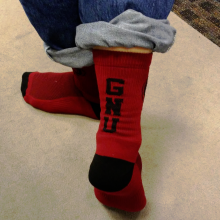 You are here: Home › Blogs › GNU Press › Socks, stickers, and freedom: Support the Free Software Foundation! 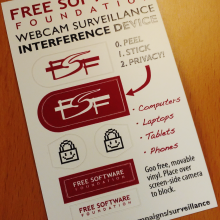 The GNU Press Shop is a key part of the Free Software Foundation's fundraising, and is essential to our outreach. As the go-to source for books and other reference materials for the happy hacker on your list, not to mention apparel, stickers, and other nifty objects to spread the message of software freedom, GNU Press can be a part of your holiday shopping as well. Members get a 20% discount – so if you're not one already, join today! We've set an ambitious fundraising goal for 2016, and naturally need to back up that ambition with some great merchandise. This past autumn, the FSF asked the community to suggest new products they would like to see in the GNU Press Shop, and you provided. Through an editable document on libreplanet.org, free software supporters submitted all kinds of ideas, some of which we're excited to announce have become real products, available for purchase now! A low-tech but high-effectiveness solution to webcam spying. A low-tech but high-effectiveness solution to carrying objects. A low-tech but high-effectiveness solution to cold or unfashionable feet. Keep the winter chill away in style: a warm hoodie, a knit hat, and a thermal mug (saves $10!). 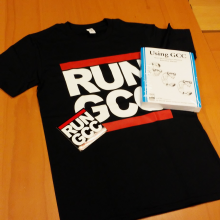 Learn all about the GNU Compiler Collection, and get a nifty matching sticker and t-shirt, too (saves $8!). A full set of reference materials for the world's most powerful and versatile text editor (saves $8!). 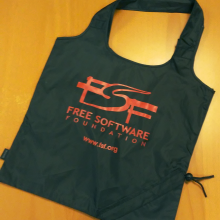 The FSF relies on individual supporters to sustain our work and the free software movement – that's why we have an online shop, and why we ask you to participate in product development. 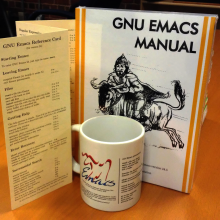 Help us reach our goal while spreading the message of free software by visiting the GNU Press Shop and having a look at these deluxe new offerings. As always, thank you for supporting the FSF!